Four men living in Peterborough illegally and wanted for crimes or anti social behaviour offences have been arrested in a number of raids in the city. Officers from the Safer Peterborough Partnership assisted Immigration Officers in carrying out a number of warrants across Peterborough city centre yesterday morning (Monday, May 23). An 18-year-old man, originally from Albania, was arrested in Garton End Road, on suspicion of being in the UK illegally. A second 18-year-old man, also originally from Albania, was arrested in Lime Tree Avenue, on suspicion of being in the UK illegally. 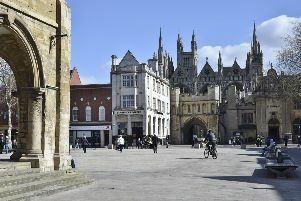 A 42-year-old man, originally from Lithuania, was arrested at The Triangle in Lincoln Road, on suspicion of being in the UK illegally. A 39-year-old man, originally from Lithuania, was arrested in Westgate, on suspicion of being in the UK illegally. All were taken to Thorpe Wood Police Station and have now been referred to Immigration Services.